While public water supplies are chemically disinfected during filtration and preparation, the similar sanitizing of residential well water systems is often overlooked. Many perceive such systems to be ‘natural’ and therefore, safe. But in order to reduce or eliminate bacteria buildup, as well as to extend the life of mechanical pumping systems and components, regular and routine sanitation needs to be conducted.As always, customers are strongly urged to consistently comply with all applicable local, state and federal laws, statutes, ordinances and regulations with regard to accessing a water well system. Water should be tested for harmful bacteria and/or pathogens to ascertain with certainty the potability of the water supply, according to US Environmental Protection Agency (US EPA) or state water quality standards, before sanitizing the well and servicing plumbing that may not require sanitizing. Consumers should sanitize a well twice a year, regardless of whether it is a new or existing well. If the well has undergone service or repair disruption for any length of time, it should also be sanitized before being put back into operation. The well storage tank, pipelines and fixtures should be rinsed with a strong sanitizing solution to inactivate all harmful microorganisms. A well sanitizer kit can be used for well, storage tank or cistern sanitation. (A kit should contain an eight-ounce [226.8 grams] jar of granules, an eightounce jar of pellets and detailed instructions for top and bottom sanitization.) 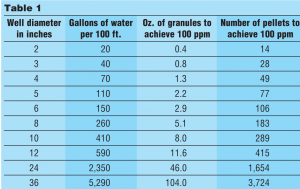 The amount of tablets and granules used will depend on the amount of water in the system. Half of the total treatment should be completed with chlorine pellets and the other half with the granular chlorine slurry. Both pellets and granules are required to ensure top and bottom sanitation of the well. ÷ 0.1337 = gallons (r = radius; d = depth; both must be in feet). A 100-ppm chlorine concentration is ideal for sanitizing a residential well. To produce this concentration, use two ounces (56.69 grams) of sanitizer pellets or granules for each 100 gallons (378.54 liters) of water in the system (two ounces of granules = 70 pellets). If the water has a high iron or sulfur content, more chlorine may be needed to achieve the 100-ppm chlorine residual necessary for effective sanitization. Note: the US EPA requirement for commercial wells is 50-ppm chlorine concentration. When preparing to sanitize wells, consumers should follow these nine tips to ensure proper well output and to maximize future well performance. 1. Bypass the water softener, filters or other water treatment equipment. Water treatment equipment should be maintained by a WQA certified professional. A 50-100 ppm solution of chlorine introduced into a resinous treatment device will result in decrosslinking of the resin. Even low concentrations of iron and manganese will be burned into the matrix of the resin and permanent fouling of the resin would result. 2. Remove the cap or seal from the casing and, if possible, measure depths of the water in the well, then refer to the instructions provided with the kit. In some instances, removing the seal to measure the water can be a difficult task. 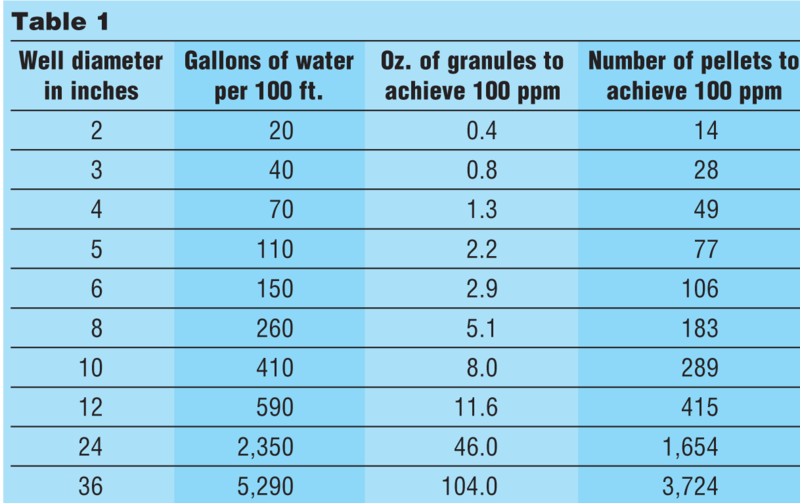 It may be easier to estimate well and water depth from a well log or other records (see Table 1). As a general rule, it is better to use too much sanitizer than too little. If too much sanitizer is used, it will simply take longer for the taste and odor to leave the system. 3. Use a pipe to get by any restriction in the well; a 10-foot (3.048 meter) length of 0.75-inch (19.05 mm) PVC is ideal. If it is not possible to remove the well cap, remove the vent or sanitation plug. 4. Drop one tablet into the well and listen to hear if the tablet hits the water. If the tablet hits the water, drop the remaining determined number of sanitizing tablets needed into the well. 5. Mix the determined amount of granules needed in a clean, plastic five gallon (18.92-liter) container of water and pour the solution down the well. For safety sake, remember, do not add water to the product, add product to the water! 6. It is necessary to circulate the water in the well to thoroughly mix the sanitizer throughout the entire water system. Connect a hose to an outside silcock that is located after the pressure tank and run water back down the well (this also rinses the upper portion of the well.) After approximately 15 minutes of circulating the water, a strong chlorine odor should be present; if not,repeat steps 4 and 5. Starting with cold-water faucets first and then hot water, run water through the service lines until you detect chlorine odor at all taps. 7. Allow the sanitized water to stand in the system for at least six hours; overnight is preferred. Open an outside faucet and flush system until water runs chlorine free (no chlorine smell is detected). Repeat flush operation on each faucet in the system. Do not run high levels of chlorine into the septic system. Before a final purge of the chlorine, flush a sufficient amount of water through the plumbing and retest the chlorine residual. Retest after twenty minutes to be sure that there is no more chlorine demand. Note: Chlorine may make the water run with color due to iron contamination; iron deposits, slime and organic material may break loose and plug pump screens. Do not continue to run pump if water does not flow. The high level of chlorine required to sanitize a water system is corrosive to most metals and the chlorine solution must not remain in the water system more than 36 hours before completely flushing from the system. 8. Return all of the equipment to the service position. 9. The water should be tested two to three weeks after sanitizing. If bacteria, iron bacteria, sulfur or other problems recur, contact your local WQA-certified water professional for further treatment. It is important to assist consumers with ensuring their homes, including water supplies, are contaminant free. Some very simple and basic tasks should be conducted annually to prevent coliform bacteria contamination and to administer some sort of shock chlorination with a certified chlorine product. Proper shock treatment is needed anytime a pump is repaired or replaced, if the water conditioning equipment is maintained or exposed and on a biannual basis. Consumers should periodically inspect wells for cracked, corroded or damaged well casings and for broken or missing well caps during sanitization efforts. At that time, wells can also be inspected for settling issues or for development of cracks on the surface seal. With all of these well inspections, do not forget to inspect the support equipment. Regular maintenance of the well pump and the septic system equipment will help ensure peak performance. Complete sanitation of well systems with certified products provides clients with a clean source of water and protects the provider as well. Better Water Industries, Inc. of Tyler, Minn. offers a range of services, products and equipment for aeration, oxidation and sanitation application in addition to treatment options for iron, hydrogen sulfide, radon, methane and many other contaminants. The company maintains a high level of customer loyalty and service, a comprehensive network of industry contacts and associates and a well-qualified personnel base to ensure customer satisfaction. Marketing Director Troy M. Tommeraasen is responsible for analyzing markets and proposing and implementing positive business strategies based on market research, product development, advertising and sales promotion programs. His efforts enhance the company’s 22 years of industry experience by providing insight to new trends and emerging markets. Contact him by email, troy@betterwaterind.com.